We’re happy to see healthy competition in every market we cover, because it spurs innovation and keeps the market leader on its toes. Founded in 2008, the German audio company Berlin Audio has recently expanded to the U.S. and is itching to take on Sonos in the multi-room audio market with its Raumfeld product line. The company sent several speakers for us to check out: The Raumfeld One S, their smallest speaker, is similar to the Sonos Play:1 and Yamaha’s WX-030. The Raumfeld WiFi Soundbar, which comes bundled with a wireless subwoofer, competes with the Sonos Playbar and Yamaha’s YSP-1600 (subs are optional with both of those speakers). And the Raumfeld Stereo M wireless bookshelf speakers, which compete against two Sonos:Play 5s set up as a stereo pair, or Yamaha’s NX-N500 bookshelf speakers (which we have not reviewed). 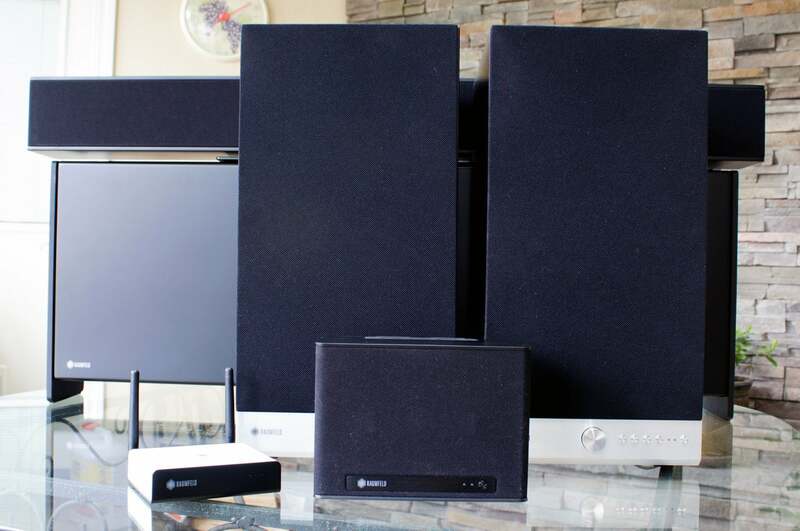 As with a Sonos system, these Raumfeld speakers can stream music over Wi-Fi or, with the addition of its Raumfeld Expand, the components can operate on a dedicated wireless network. If your home environment is absolutely hostile to wireless networks—a common problem in Europe, where many homes and apartments are constructed from masonry—each component also has an RJ45 jack for hardwired ethernet. There's no support for either Bluetooth or Apple’s AirPlay streaming-audio technology. Raumfeld’s Expand module will create a private wireless network dedicated to its own speakers. 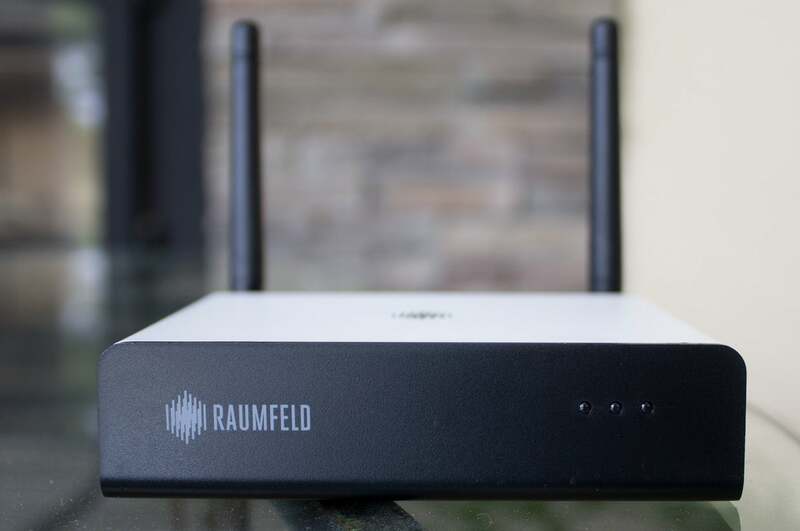 The initial setup of a Raumfeld system is a bit complicated, as you must first join the smartphone or tablet that’s running the company’s app to the speaker you wish to add to the network before it can connect to your Wi-Fi network. It’s a clumsy process, but you need do it only once for each speaker (and for the Expand, should you decide to incorporate one). Sonos has a much better setup process. The Raumfeld speakers mix an old-school aesthetic with very modern technology. Many of these speakers are all hard corners, MDF cabinets, and rotary knobs. That’s not to say they’re unattractive, just that they look very traditional—even classic. In fact, the company offers a pair of tower speakers, which we did not have an opportunity to review. We did get a chance to audition its wireless subwoofer, which is something of a departure from conventional design. 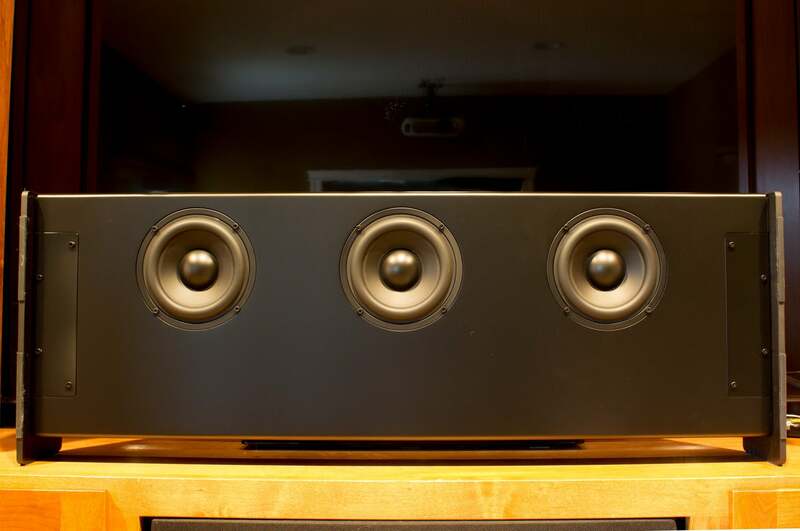 Where most subs are packed in cube-shaped enclosures, the Raumfeld has a 240-watt Class D amplifier and three 5.1-inch woofers in a cabinet that’s three feet wide and just 4.7 inches high. It’s the perfect size to slip under your sofa—or behind it, since it can also operate vertically, with its drivers facing the wall instead of the floor. Alas, the sub can be used only in conjunction with the sound bar. On that score, we much prefer the Sonos Sub, which can be paired with any Sonos speaker. You’ll find more details about the sub in our review of the Raumfeld sound bar. This is either the back side or the bottom of Raumfeld’s subwoofer, depending on how you orient the unit (vertically, facing the wall; or horizontally, facing the floor). No one beats Sonos when it comes to support for a broad range of streaming-music services, but the Raumfeld system supports most of the biggies: Spotify Connect, Rhapsody, Tidal, and SoundCloud. TuneIn is supported for Internet radio stations, and Raumfeld has announced its intention to support Google Cast, which will add support for Google Play, Pandora, and Deezer. But that feature was not available at the time is of this review. The Raumfeld system does beat Sonos in terms of the audio-codec support. Where Sonos officially supports FLAC files at a maximum of 16-bit resolution and a sampling rate of 44.1kHz FLAC (16/48 unofficially), Raumfeld’s system can stream FLAC files of any resolution and sampling rate. Note that doesn’t mean it will stream files that big wirelessly, just that it will try. The Raumfeld system also supports a number of other popular codecs, including MP3, M4A containers with AAC or ALAC files, Ogg Vorbis, Opus, ASF, and WMA (but not the lossless variety). Streaming DSD files, on the other hand, is not supported. The company recommends using wired connections to stream high-resolution audio. When I connected three zones on my Wi-Fi network, I noticed a significant delay only in the subwoofer. I’m sure this is because the other speakers receive the stream directly over the network, whereas audio must be relayed to the sub from the sound bar. That relay notwithstanding, the delay disappeared once I added the Expand module and made it the wireless host in place of my Wi-Fi router. After that, I had no problem streaming the same 24/96 FLAC file to three zones simultaneously, or different 24/96 FLAC files to each of the three zones. I set up three zones for testing, with and without the Raumfeld Expand unit (front left): I placed the One S (front right) in the bedroom, the Stereo M bookshelf speakers (middle right) in my family room, and the WiFi Soundbar (back, on top of the sub) and subwoofer in my home theater. The Raumsfeld app is quite busy looking and its user interface is not well executed—it tries to surface nearly every function it’s capable of performing. In the iOS version on an iPad, buttons at the top link to your personal music library, your playlist, Tidal, TuneIn, Spotify, and line-input (the bookshelf speakers and the sound bar have analog stereo line-level inputs, but the smaller One S does not). There’s also a Home button that takes you to a “favorites” list (essentially, a master playlist that you’ve built out), a Settings button for tweaking various system settings, and a Music Services button with a list of all the supported services (but you’re stuck with the placement of the Tidal and Spotify buttons, even if you don’t subscribe to those services). A row of buttons beneath this changes function depending on the source of your music. If you’re playing music from your own collection, you can sort the listings by artist, album, genre, or composer. 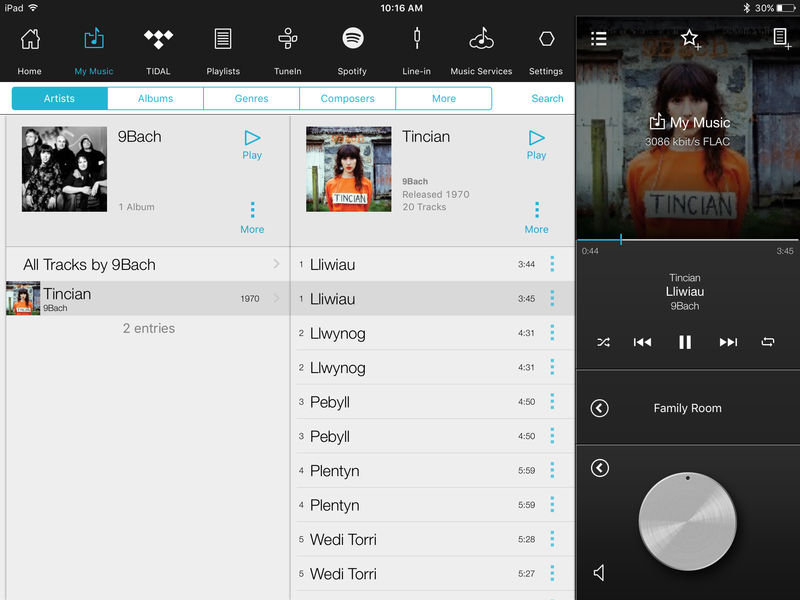 If you’re streaming music from a service, the layout changes to suit that service. The Raumfeld app, shown here on an iPad, comes with a steep learning curve. It can do everything you’d want, the trick is figuring how which buttons and icons do what. (The tracks here are listed twice because one set consists of 16/44.1 FLAC files and the other is 24/96 FLAC files. The column on the right-hand side is the only part of the user interface that remains constant no matter which library you’re listening to. That’s a good constant to have. It displays album art for the currently selected track, but album art must be embedded in each track—having an image in the folder isn’t adequate. If there’s no album art associated with the track, you’ll see a music note. Tap this window and the app will reveal the source of the track, its bit rate, and its file format. You can also edit the currently playing track list (moving tracks up and down the order or deleting them entirely) by tapping an icon at the top of this box. A box beneath that contains transport controls (play, track forward/back, shuffle, and repeat). 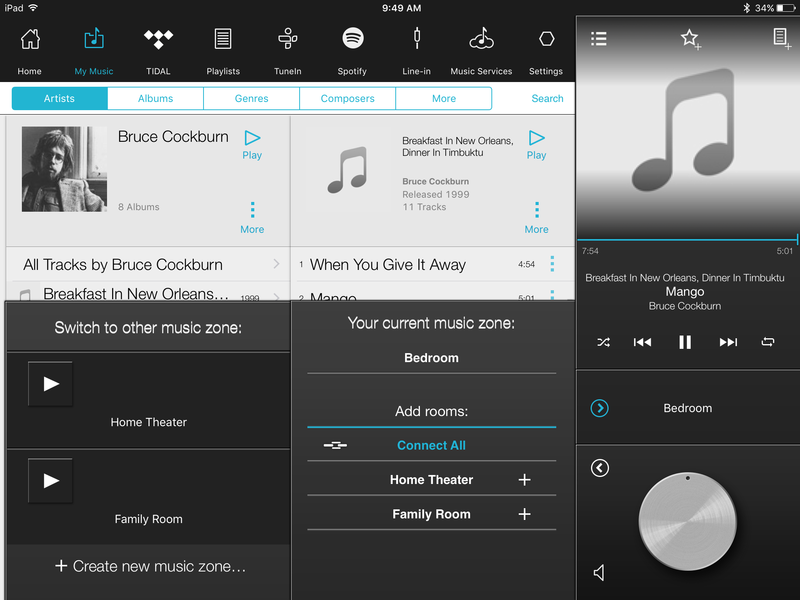 A box beneath that displays the music zones you’ve configured. Tapping an arrow button in this box expands it so that you can group zones together and split them apart again. A large volume control knob in the fourth and final box in this column—as I said, the app is very busy—lets you control the volume for the actively selected zone. Tapping the arrow button here expands the box to expose a linear slider for volume control (one for each zone, if you’re streaming the same track to more than one) and another button for a three-band equalizer (bass, midrange, and treble). Switching zones is an awkward process involving too many steps. The two remaining columns to the left change depending on which one of the nav buttons is selected: If you’re browsing your own music collection, the left-most column displays the artist’s name next to a Play button that will play all the music you own from that artist. The box below that lists all the music you own from that artist (albums first, and then individual tracks if you don’t have the entire album or if they belong to another artist’s album or an album by various artists, such as a soundtrack). Select an album and the column in the middle will display the album’s cover. 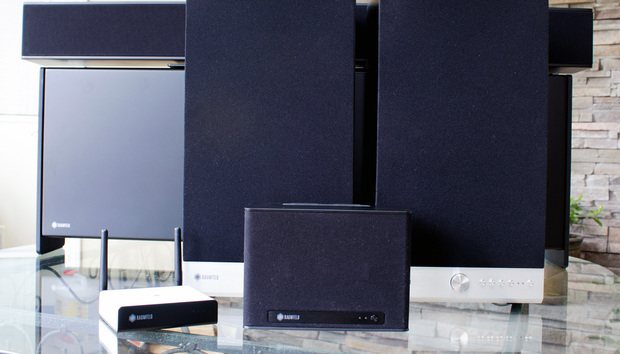 Sonos remains the multi-room audio system to beat, but this Raumfeld system a very good solution. It has all the right components—we particularly like the sound of the diminutive Raumfeld One S—and it exploits Sonos’ bigggest weakness by supporting high-resolution audio (although Yamaha beats both companies on that score by supporting DSD streaming on its higher-end MusicCast components). For all of Sonos’ hardware engineering prowess, ironically, it’s Sonos’ software that makes its system superior to any of the multi-room audio systems we’ve reviewed to date. If you’d like to know more about the individual Raumfeld components, just click on the product names below, or use the arrows below to navigate through the story.